Your front bar should be a 22mm later style bar, possible it may have been changed to a 24 mm at some time. I have all of the bushes in stock. 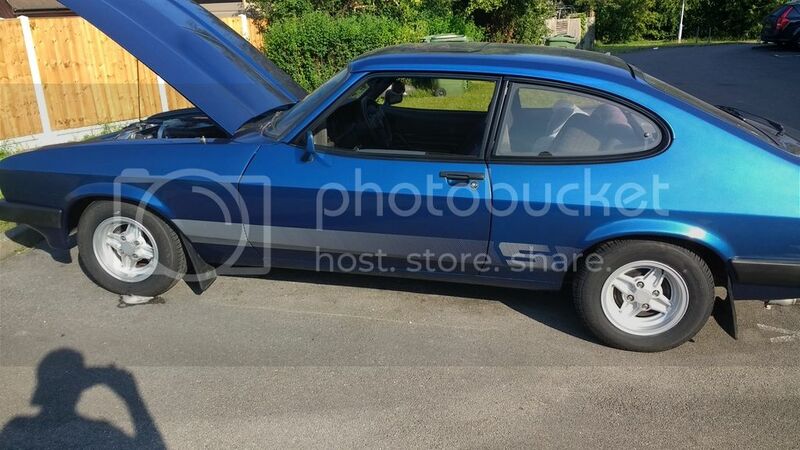 The earlier style of bar was only used up to the very early MK3 but with the correct mounting brackets the bigger, later bars can be fitted to any Capri. Surely if the calipers were sticking you would notice brake dust on the wheels? Have you tried changing the inner bushes in the track control arms? if they're worn then that would give the symptoms you have. Another thing, it's possible that the ARB and or the lower steering arm might have been damaged in the accident but the alignment being checked should have highlighted this. Caprigear wrote: Your front bar should be a 22mm later style bar, possible it may have been changed to a 24 mm at some time. I have all of the bushes in stock. Thanks. No i have not changed the bushes in the TCA's yet, would have been the first thing i did if it wasnt for the fact they were only replaced with brand new units no more than a couple of years ago so they should still be good but i guess if nothing else has helped thus far i might as well try them next as im running out of things to replace. Regarding brake dust the front wheels do get dirty faster than the rears but i thought that was normal just due to the fact they are discs and not drums like the rear. The steering rack has been replaced with a newly refurbished one so the arms should be in perfect working order now, i haven't touched the ARB however but someone would have noticed if it was damaged by now what with how many times everything under there has been looked at, and like you say the alignment would have shown it too. The alignment was out slightly but the adjustment hasnt fully cured the problem so theres still something sinister going on. As it stands its the best its been since noticing the problem but it still isnt 100% so the mystery continues. Are the bushes you supply polyurethane ones and branded? The bushes I supply are Superflex, I've been an approved stockist for years now. I won't fit anything else. If the inner bushes are standard rubber then there's every chance that they are worn. Caprigear wrote: The bushes I supply are Superflex, I've been an approved stockist for years now. I won't fit anything else. If the inner bushes are standard rubber then there's every chance that they are worn. How much do you charge for the inner track control arm bushes? Tempted to do this next. I'll get you a delivered price on Monday, my lists are at work. Caprigear wrote: I'll get you a delivered price on Monday, my lists are at work. Ok cheers. It'll probably be a couple of weeks until I can afford them anyway so no rush. I have finally cured this problem! Turns out is was an alignment issue all along. How did i do this? Well i bought 4 new tyres from a place called "F1 Autocentres" online, they have a large garage near me where they fit them and in with the price of fitting and balancing they threw in a free alignment check as well (along with something called "precision balancing"), even though ive already had the alignment checked i figured why not since its free. Anyway, after fitting the tyres and balancing the wheels and refitting them they put the car up on a ramp and used a computer and some other nifty looking gizmos to check it. Anyway i was called over to have a look at a graph on this screen and it showed all the different things such as camber caster and toe etc. So it seems my mate's mechanical alignment tool must be miscalibrated, because they adjusted the toe and got the bar into the green for me (at a slight extra cost). I then took the car for a high speed blast down the A13 to test to see if the wobble was sitll there and make sure the tyres were balanced properly and OMG it was like driving a totally different car! No wobble at any speed through the steering, and zero vibrations through the car! So the saga has finally come to end, and i can stop haemorrhaging money and worrying about this stupid thing and go back to enjoying my Capri! So in case anyone in the future has this same problem and you have tried seemingly everything, just get your alignment checked straight away! Save yourself an ocean of trouble and get this checked first, preferably by someone with a ramp and a high tech machine! Oh such a relief....i can now sleep at night, at least until the next problem occurs lol. Sound like the same piece of kit Ed China used on Wheeler Dealers...... Clever stuff. You have the 4 spokes back on now? Thanks. Yeah the colour really shines in this sort of weather, and i haven't even cleaned the car for a week or two. Do you wear a baseball cap backwards? pbar wrote: Do you wear a baseball cap backwards? Yep. The 90's is strong in this one. lol. Well done for sticking with it. Did you see how they adjusted the toe in. Did it need much more on one side that the other or was it fairly equal ? Remembering back did the problem get worse after having your tracking adjusted ? Not_Anumber wrote: Well done for sticking with it. Did you see how they adjusted the toe in. Did it need much more on one side that the other or was it fairly equal ? I didn't see how they did it but the graph did show before they adjusted it that both sides were out by a massive amount. I think the whole car was basically pigeon toed. Last time the alignment was adjusted it made zero difference, but I think my mate's alignment tool wasn't set up properly. He used this old fashioned looking thing with mirrors and such whereas the garage used something a bit more advanced with a computer connected to it and obviously it proved a lot more effective lol. They even said to bring it back in a week or two to recheck it and make more adjustments if needed.